Quarterback Will Marty and teammates celebrate after a touchdown. After a 2-0 start, Butler is 1-4 in its last five games. Jimmy Lafakis/Collegian file photo. At some point during the season, all of the below adjectives could have been used to describe Butler’s football team. Undefeated. Winless. Good. Bad. Clutch. Not clutch. Surprising. Expected. None of these alone can accurately sum up Butler’s season so far by itself. Let’s look at each pair of contrasting words to figure out why neither work in order to find the word that does. Butler could’ve been described as winless only until the final whistle of Week 1, when they upset the No. 24 ranked Youngstown State Penguins. They’ve since beaten Taylor in their second game and Morehead State in their fourth. 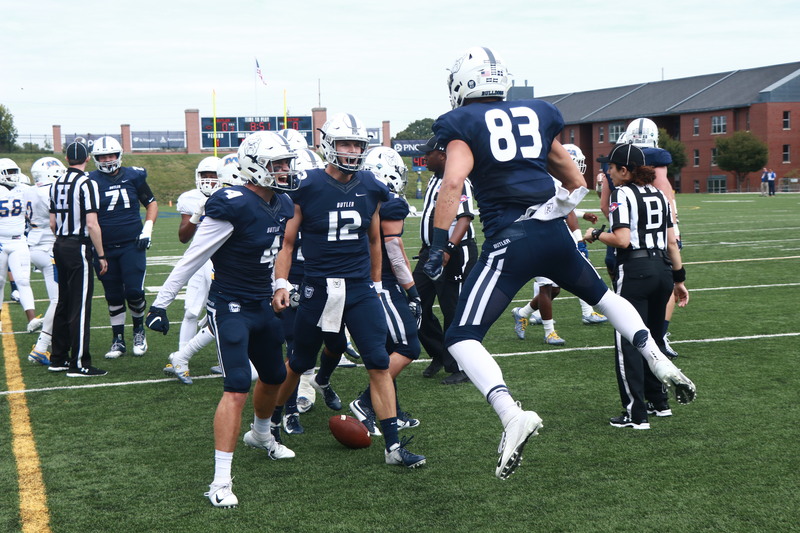 Butler was undefeated through Week 2 before losing at home to Princeton in the third game of the season. The Bulldogs have lost three consecutive conference games to Drake, Valparaiso and San Diego. Butler sits at 3-4 overall with a 1-3 conference record. Butler has shown flashes of both good and bad but hasn’t consistently been either one. Even at different points in the same game, the Bulldogs have seemed like a different team. The last game against San Diego was a great example of this. In the first half, Butler surrendered five touchdowns and looked hapless. The Bulldogs’ only sign of life was a drive that they took to San Diego’s 2-yard line but ultimately resulted in a turnover on downs. The second half was a completely different story. Butler came out energized with a renewed sense of confidence. A quick touchdown, a three and out and a forced fumble could have easily changed the outcome of the game. If a couple of things had gone differently and the lead wasn’t so monstrous, maybe Butler pulls off the upset. Conversely, the game against Youngstown State featured a slow start and strong finish. Down 21-7 after three quarters, it took a miraculous turnaround to come out victorious. Two touchdowns, a recovered onside kick and a game-winning field goal exemplify how good this team can be. And they believe if they play like they know they can, they can beat anyone. Still, as Voris pointed out, the Bulldogs have yet to put together a complete good game. However, only the game at Drake could be described as a completely bad game. Butler moved inside of Drake’s 30-yard line only once in the first three quarters of the game. The fourth quarter – the only one in which they put points on the board – also featured two turnovers on downs and nine points surrendered. Butler lost the game 36-6. The two best examples of these are the aforementioned game against Youngstown State and the game against Valparaiso. The end of the Valparaiso game was close, similar to the Youngstown State game, and the Bulldogs found themselves down only four and in possession of the ball to start the fourth quarter. A turnover on downs in Valparaiso territory made way for a surrendered touchdown, which made way to an interception, which made way for another surrendered touchdown. According to Voris, a single play can only sink you if you let it. The Bulldogs did just that against Valparaiso but did the opposite against Youngstown State. Even after a failed two-point conversion attempt to win the game, Butler stayed focused. Perhaps junior linebacker Mason Brunner summed up the two sides of the team best. The Bulldogs also pulled out a win against Morehead State that came down to the last defensive stand, so the team can’t be described as clutch or unable to make the big play. The Youngstown State game and the Valparaiso game are also the only two that had a very surprising result. Youngstown State came in nationally ranked and as a 36-point favorite over Butler, and Valparaiso went into their game with an 0-5 record. The remaining games have largely had expected results, but these two were both at the other extreme. While a 3-1 record that has manifested itself into the 3-4 record that took its place seems like a letdown, it largely has to do with the opponent. San Diego and Drake are simply much tougher than Taylor and Morehead State and played Butler like it. San Diego hasn’t lost a conference game in more than three years and Drake had lost only two conference home games in that same span going in to their matchup. So, what is a team that is neither good nor bad, undefeated nor winless, clutch nor unclutch and surprising nor expected? This team has transcended labels, and maybe that’s okay. Instead of trying to describe the team that can’t be described, maybe it’s time to just let football be football.